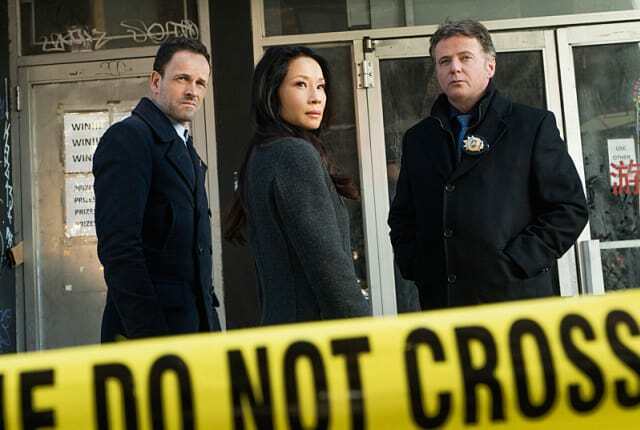 When you watch Elementary Season 4 Episode 14 online, Sherlock continues his investigation into the attempt on his father's life while simultaneously assisting Gregson and Bell look into the case of the murder of three members of a Chinese Triad, brutally killed with a shotgun. They realize quickly that the victims were somehow tricked into lowering their guard, presumably by someone they knew. This could mean that a member of their gang was subverted by a rival triad, which could mean an all-out bloody war between the two factions. It becomes essential that the team solve the case and discover the identity of the killer before the streets descend into violence and a cycle of deadly retribution. Meanwhile, Sherlock turns the focus of his personal investigation into the assassination attempt on Morland towards Sabine, his girlfriend who was killed during the incident. Suspecting that she could have somehow been involved with the plot, Sherlock confronts his father, who takes the opportunity to reveal some startling and even bitter truths about Sherlock's mother, who has been dead for many years. How will Sherlock react to this information? Find out when you watch Elementary Season 4 Episode 14 online! Sherlock: It's quite an audience today. If it wasn't for the lack of paparazzi, I'd assume that a reality TV star got vivisected. Gregson: Three Chinese gangsters got shotgunned.